The fall season is in full swing in our house, and we are giving our best efforts to get the most out of it. Every year seems to go quicker and quicker, so this time around we've made a list of what we want to enjoy this autumn. 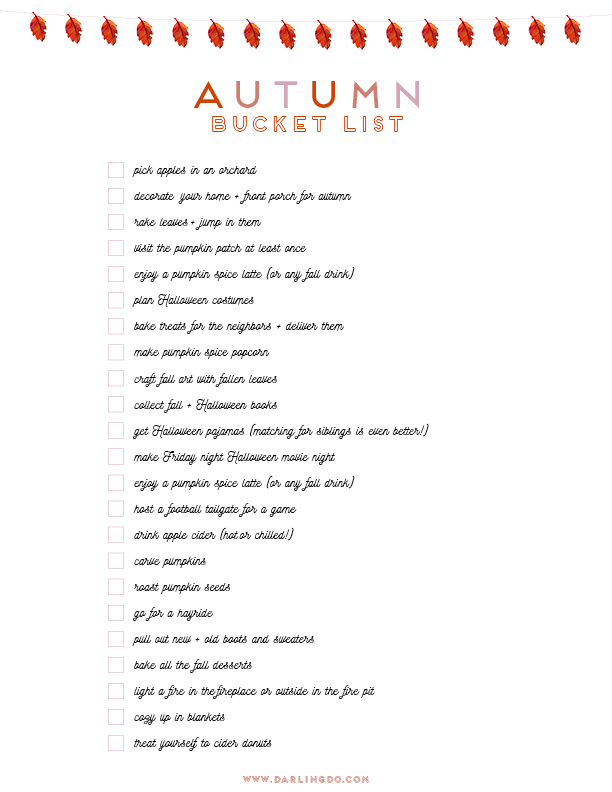 And since it's sometimes hard to remember all the things you want to do, I've put together our bucket list for you to use too! You can download and print it for yourself by using this link! We are hoping to go apple picking this weekend, but with the impending hurricane we may have to reschedule. We're going to make a last minute decision late tomorrow. Instead, we may be home enjoying fall/halloween movies and munching on pumpkin spice popcorn (all on our bucket list!). We shall see! I'm hoping to share our fall home tour in the next two weeks, but until then I hope you can find some inspiration from last year's fall decor! And if you need a fall recipe, check out this one for pumpkin loaf and this one for sea salt + toffee chocolate chip cookies! Of course, if you're looking for the right drink to pair with those, grab this list!